Dimitri Nassar began playing the piano at the age of five, and has played professionally for over 20 years. 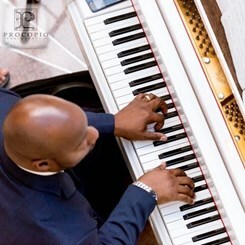 He has taught over 400 pianists ranging in ages from 3-years-old to senior citizens. Dimitri Nassar students have been accepted into various area performance arts academies, ensembles, festivals, showcases, and collegiate music programs. He obtained a B.S in Music Education from South Carolina State University, and completed graduate course work at Bowie State University, University of Maryland, and Boston University. Currently he is completing a master degree in Music Education at Anderson University. Mr. Nassar is a Maryland Certified Music educator with over 20 years teaching experience in the Maryland Public School System. Mr. Nassar has led student ensembles in music festivals in Atlanta, Virginia Beach, Kings Dominion, Busch Gardens, Hershey Park, and Cedar Point. Fame (1995). His considerable talents have also been recognized by Ohio’s TriC and Lakeland jazz festivals and the Count Basie Jazz Festival in Hampton, Virginia. The Dimitri Nassar Trio has been featured at Mary Washington University Multicultural Fest, Congressional Black Caucus, Virginia Beach Neptune Festival, and the National Cherry Blossom Festival. The Dimitri Nassar Trio was a 2009 finalist in the Chick Webb Jazz Competition. Request Lessons with Dimitri today!